How perfectly 'everyday with everything' are these earrings from jewelry brand Tapley? Last year, J. Colby Smith gave our ears an incredible makeover, reviving a few long abandoned high school-era piercings and adding a couple new ones. The result was a perfectly asymetrical mix of fitted rose gold hoops and tiny circle studs that are meant to be worn permanently. It's the ultimate set-it-and-forget-it earring look but every once in awhile, a real stunner pair like these comes along and makes us want to switch it up a bit just for a night. If you're thinking about a new piercing (ear or otherwise!) 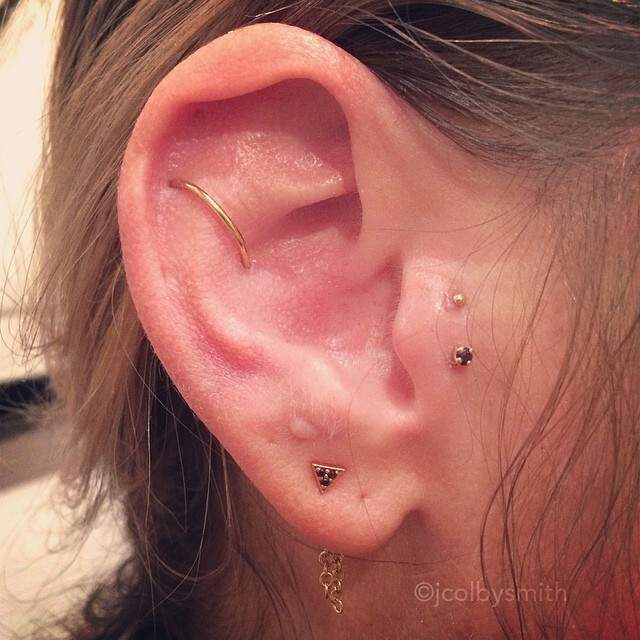 J. Colby is a true artist and has elevated the practice of piercing to something really beautiful and unique. You're guaranteed to leave with a look that suits you uniquely and we can't recommend him enough. Catch a few of his distinct looks below. In the meantime though, pick up some Tapley goods and let us live vicariously through your ears.